My Aloe Vera wasn't looking good. See what caused this & how I made it a whole lot happier by repotting & moving it. 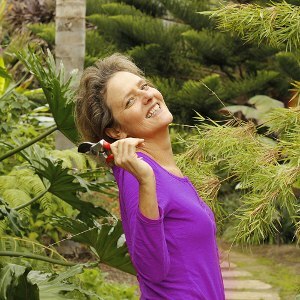 I love my Aloe vera and use it almost every day. It’s truly a plant with purpose! It was in a warm, sunny spot my front garden and both the plant and pot were looking looking a wee bit sad. It was time to take action and make my beloved plant a whole lot happier. By the way, the pot will get a facelift one of these days. Here’s the Aloe vera & the pot before the re-do. You can see all the dried & discolored leaves as well as the roots growing out of the bottom. The painted had almost completely peeled off the pot. Not a pretty sight. A couple of Winters ago we had a 4 day cold (around 35 degrees…brrrrr) and rainy spell, not too common for us here in Santa Barbara. The succulents were saying: “what’s up with this?”. 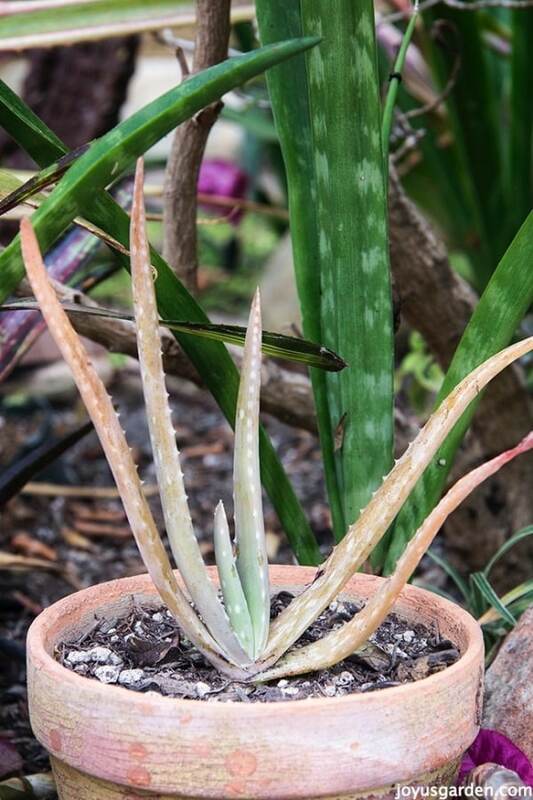 That in addition to the fact that my poor Aloe was getting too much direct sun and needed repotting had caused the leaves to turn pale and orangish. 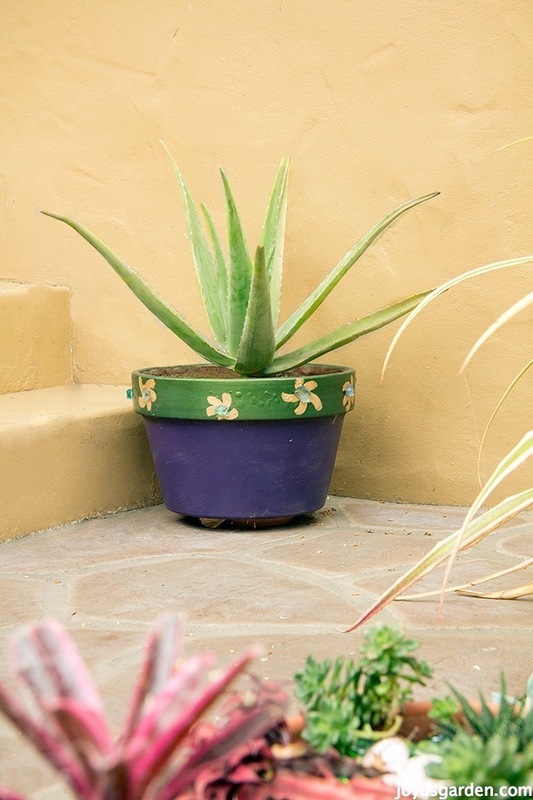 Here’s something you need to know: the leaves of the Aloe Vera will turn orange if they get sunburned. I’m sure the environmental stress of that cold rain didn’t help either. Here’s the baby, or Aloe pup, which I removed off the mother plant. The baby in it’s new pot. It lives under a Coprosma & next to a bromeliad so it’s mostly shaded. It’s starting to green up a bit too. If you want to watch me repotting this Aloe, see what potting mix I used and learn how to remove the baby, then be sure to watch the VIDEO below. Lucy had to help me pull it out of the pot and quite a few of the roots were lost but no worries, this is a tough plant. Almost 3 months later, it’s firmly rooted in and greening back up like crazy. Here are their fat, fibrous roots. They store a lot of water in those roots & leaves so don’t overwater them. * They’re succulents so use a fast draining mix. Again, refer to the video to see the recipe I used. 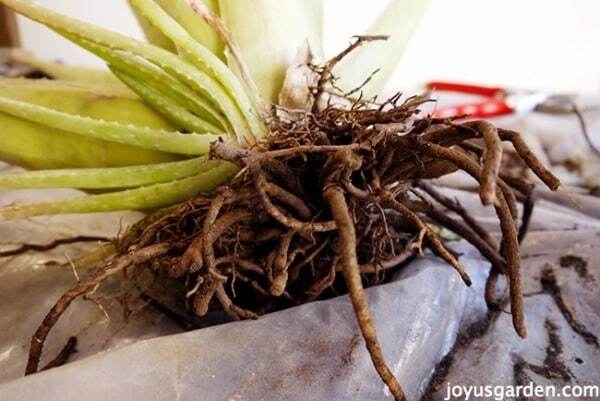 * They root deep so don’t use a shallow pot, they need room for their roots to grow down. * Wait until the babies are a good size to remove them. 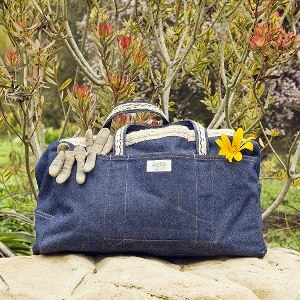 * Don’t place in hot sun after repotting. Sun is fine as long as it’s not hot & there’s not too much of it. * Don’t water frequently. I water the baby every 3 weeks because it’s in a small pot. The mother gets watered thoroughly about every 2 months. Here’s the new digs for my Aloe vera. 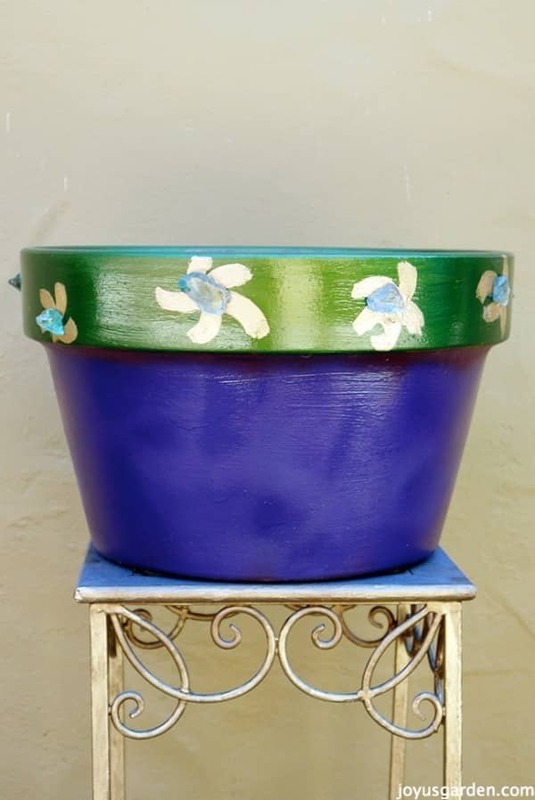 It’s a tricked out, painted plain terra cotta pot. I love to use glass chips as adornments. 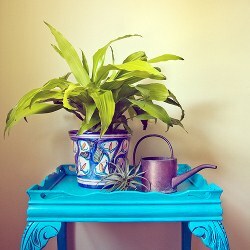 My plants so deserve an artistic home! This pic was taken 3 months after the making of the video & the plant now lives at the base of the stairs leading up to my front porch. It gets nice bright light with a bit of filtered sun & has greened up already. I can easily snip a leaf when I need it. 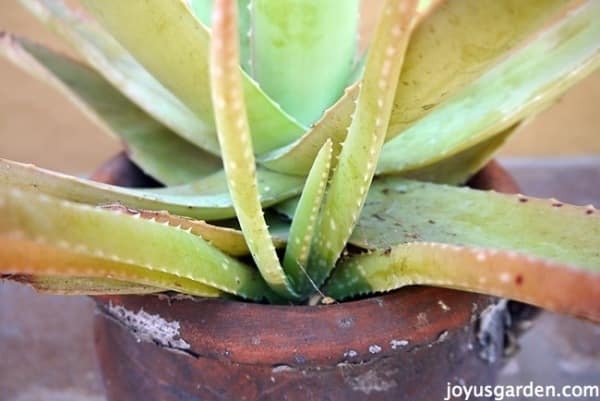 Coming up very soon: a video and blog post on How I Care For And Use My Aloe Vera. Hint: I have many uses for my Aloe! 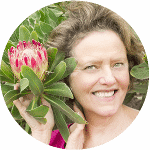 If you’re interested on how to care for Aloe vera a a houseplant, check out my book Keep Your Houseplants Alive . sometimes the sound is not consistent and you are hard for me to understand. 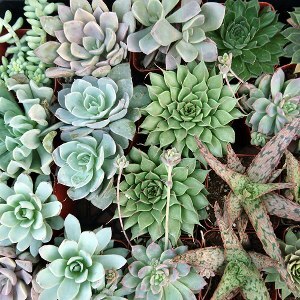 But…..having said that I love the fact that you can grow just about anything and love how you share with us ways to propagate plants. Keep up the good work. You’ve still been added to my bookmarks. I’ve still got a lot to learn as I repotted my aloe Vera to a much bigger pot but I put it in a greenhouse (since I live in the UK and temperature is usually 10 to 14 degrees….) I then went on a three week holiday only to find out the temperature has been at least 30 degrees Celsius! My poor plants were burnt but after chopping off the burnt parts I’m determined to look after it right! Hi, im in the uk , we are in our winter months, i used perlite , building sand and top soil for repotting, the soil is dry, they are placed next to a heater indoor, do get some sunlight in the morning being next to the french doors, temperature 21’c – 26’c all day long, 3 months down the line, the leaves look pale or dull green, the growth is very slow, pls advise. I have a lot of aloe vera in 1 large pot. My roommate has one huge aloe in a small pot. 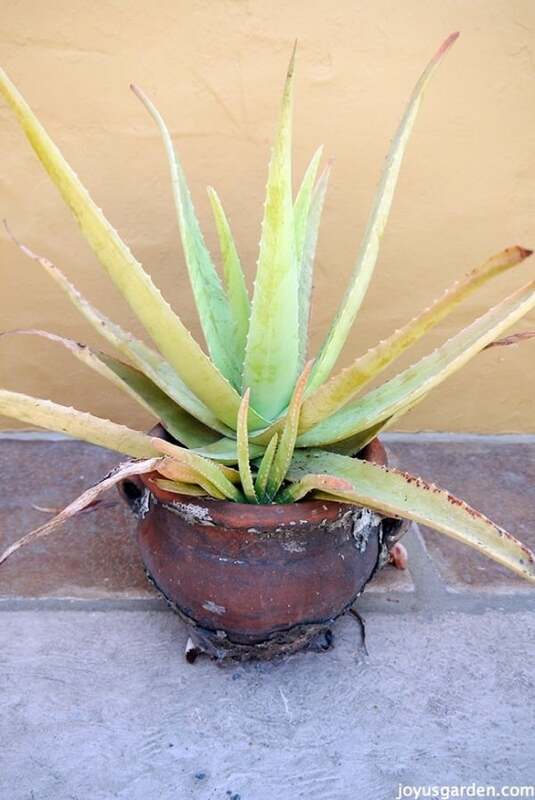 How do you grow one single aloe in 1 pot. Is it because hers is a different variety? The ones in my large pot are making babies all the time. In fact, I believe one of my babies is now in her pot. She had this plant for 2 or so years before I moved in, and she never had a baby in her pot before. I learned about the partial sunlight thing from my mom who had a beautiful deep green aloe that was outside on the patio where the back of the house and the attached outside utility room met (L-shape) where the direct sunlight didn’t quite reach. Hi Nell, I’m in Sydney AUST -it’s summer! I have a large Aloe Vera plant in a largish plastic pot. I water it daily. It doesn’t have any pups and I’ve had it six years! Am I watering it too often? I bought a couple plants and one was Aloe Vera. We have city water and it’s real bad. It started killing my plants. I now have replanted all and am watering with better water. Every plant is alot better except for my Aloe. (I don’t water a bunch and it’s in I direct sunlight.) It’s brown…Will it turn green again? Or is there no chance? Oh, and I replanted it in Cactus soil. It only had 3 roots but they were huge. Our aloe has sprouted a long stem with some buds at the top of it. Is this normal? I have brown limp leaves at the bottom of my plant. Should I cut them off? I recently put my aloe vera plant outside in direct sunlight with the intention to bring it back inside a few hours later but forgot about it for a day and a half. I am assuming it’s sunburned or just very stressed out as the leaves on the bottom of the plant are all very purple and drooping (the newer growth stayed green though). Will those go green again once it’s no longer stressed or should I cut them off?